At GoCustomized, you can make your own iPod Touch case from scratch in only a few simple steps. First of all, you have to choose the case type that will be the base for your new custom phone case and its color. We offer different types of cases so that you can choose the personalised iPod Touch case that fits your needs best. Next, you can either upload your own picture from your device or social media account or choose one of our designs that are available in the design tool. Finally, you can use the many features of our customizer tool to edit your design by adding stickers or text or applying a filter until it looks exactly like you want it to. It really is that easy to make your own iPod Touch case! Lets give it a try now! Our personalised iPod Touch case is made out of high-quality materials to ensure your device is well protected at all times. 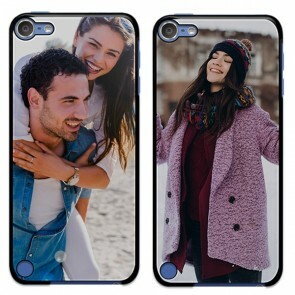 In addition, the ink we use to print your personal design on your case is scratch-proof to ensure the great look you created doesn't suffer any damage. While you make your own iPod Touch case you should take a second to think if any of your friends or family members would also like to have one. Our personalised iPod Touch case with a nice picture definitely is a very personal but still really affordable gift. Make your own iPod Touch case for about any upcoming occasion including birthdays, anniversaries or holidays like Valentine's Day or Mother's Day and we guarantee you won't regret the choice! A personalised iPod Touch Case is simply perfect to convert your favorite memory with the other person into a tangible object, which allows you to reminisce about this special moment every time you look at it. We produce and ship all orders within 24 hours to make sure you receive it as fast as possible. In case any of your questions remained unanswered, you can have a look at out our FAQs or contact our customer service team via support@gocustomized.com for advice.